Abuses of dominance are prohibited under Belgian law pursuant to Article IV.2 of the Code of Economic Law (CEL). Article IV.2 of the CEL is the domestic equivalent of Article 102 of the Treaty on the Functioning of the European Union (TFEU), and its wording is almost identical to the EU provision. As expressly acknowledged by the Belgian legislature, Article IV.2 of the CEL is intended to be a ‘carbon copy’ of Article 102 of the TFEU to align the interpretation of the Belgian and EU rules on dominance. In effect, such a legal transplant allows companies to rely on EU precedents before the Belgian Competition Authority (BCA) and the Belgian courts,2 that is, on the European Commission’s decisional practice and the case law of the EU General Court and the European Court of Justice. In the same spirit, Article I.6 of the CEL defines the notion of dominant position in the same way as the European Court of Justice did in Hoffmann-La Roche, namely as a position enabling an undertaking to ‘prevent effective competition being maintained on the relevant market by affording it the power to behave to an appreciable extent independently of its competitors, its customers and ultimately of the consumers’.3 Again, that transplant was expressly intended by the Belgian legislature to ensure consistency with EU precedents in the application of dominance rules and, therefore, to bring as much legal certainty as possible in an area of competition law that is notoriously unstable.4 References to EU case law are therefore very common before the BCA and the Belgian courts, which rely heavily on EU precedents in their decisions and judgments irrespective of whether Articles IV.2 of the CEL and 102 of the TFEU are applied jointly or not. In the absence of Belgium-specific guidelines or policy statements on the application of Article IV.2 of the CEL, the Commission Guidance Paper can also be used as a source of authority in the Belgian context,5 at least as much as it can be relied upon in the EU context. In theory, Belgian and EU rules on dominance are therefore perfectly aligned.11 However, in practice, Belgian law is characterised by the same tensions that have long affected the enforcement of dominance rules at EU level, notably between a more formal and a more effects-based approach to the assessment of abusive practices. In particular, Belgian courts sometimes rely on somewhat formalistic reasoning and tend to interpret Article IV.2 of the CEL in the light of perceived ‘fairness’ requirements (i.e., without assessing the existence of (likely) anticompetitive effects or the actual incentives of dominant undertakings to engage in foreclosure strategies). Throughout the 2008 to 2017 period, the BCA adopted approximately one-third of its decisions on the basis of Articles IV.2 of the CEL and 102 of the TFEU. This high average conceals a drop over the past couple of years, which suggests convergence between the BCA and competition authorities in neighbouring jurisdictions and at the EU level (independent of commitment decisions). In 2017 there was slightly more activity by the BCA, which issued one abuse of dominance decision on the merits, and found prima facie evidence of abuses of dominance in two interim measures decisions. In 2017, the BCA found for the first time that ‘denigrating practices’ could constitute an abuse of dominance in its Algist Bruggeman (AB) decision. In addition, the BCA adopted two noteworthy interim measures decisions. it offered selective rebates (or supplies of free yeast) to certain bakers that had purchased competing yeast brands, or considered doing so, in exchange for loyalty to Algist products. The Auditorate found that these measures were aimed at foreclosing suppliers of lower-priced yeast. Secondly, the Auditorate found that AB had abusively tied the supply of liquid yeast to the acquisition of a dosing installation, for which it unilaterally set a (long) depreciation period factored into the price of the yeast, and which it linked to non-compete clauses for bakers’ yeast purchases. Thirdly, AB had engaged in abusive denigrating practices against Basic Bakery, a competitor that had entered the market in 2008. Notably, AB circulated biased internal reports about this competitor’s product (called Enzym) unsupported by findings of official bodies. The Auditorate found that these practices aimed to create uncertainty about the microbiological aspects and quality of the competing yeast, and to discourage distributors or bakeries from supplying or using the product. After its investigation, the Auditorate entered into settlement discussions with AB, which resulted in a decision in which AB acknowledged the infringements, and the Auditorate fined the company €5.5 million. On 19 June 2017, the BCA decided not to order interim measures requested by Medicare-Market (MM) against the Order of Pharmacists (OP), Belgium’s national official association of pharmacists, in a case dealing with the application of dominance rules to a regulated profession benefiting from a legal monopoly.13 MM runs a number of pharmacies and para-pharmacies (i.e., shops selling health and well-being products other than regulated medication) in separate but often adjacent locations. MM alleged that the OP had engaged in various practices breaching Articles 101 TFEU and IV.1 of the CEL, and Articles 102 TFEU and IV.2 of the CEL, and applied for interim measures essentially prohibiting the OP from imposing disciplinary sanctions on pharmacists working with MM. The College (the decisional body in the BCA’s two-tier structure) applied the two-pronged test for interim measures: prima facie evidence of anticompetitive practices, and an urgent need to avoid a situation likely to cause a serious an imminent prejudice that would be difficult to remedy or to prevent harm to the general economic interest. It found that various practices could prima facie constitute breaches of Articles 102 TFEU and IV.2 of the CEL. In particular, it found that the OP’s press campaign about MM’s potential harm to the profession of pharmacists and to patients, and its reproaches against pharmacists working with MM, could constitute attempts to broaden the scope of a legal monopoly beyond the limits set by the legislator to cover para-pharmaceutical products. However, the College found that there was insufficient evidence of a serious, imminent and difficult-to-remedy prejudice, or of a harm to the general economic interest, even though a few pharmacists had resigned from MM pharmacies. The case on the merits is ongoing. By contrast, on 20 December 2017, the BCA imposed interim measures on the Fédération Equestre Internationale (FEI), the Global Champions League (GCL) and Tops Trading Belgium (TTB) requested by a Belgian equestrian team and a horse rider.14 The FEI is the governing body for equestrian sports, and GCL and TTB are organisers of the Global Champions Tour (GCT), an equestrian competition accredited by the FEI. In 2017, the defendants concluded a memorandum of understanding (MoU) regarding the organisation of equestrian competitions and recognition by the FEI, which the complainant alleged breached Articles 102 TFEU and IV.2 of the CEL, notably because it significantly reduced the share of participants selected based on their ranking rather than non-sport related criteria (such as membership in a paying team). The College considered that the FEI was dominant in the EU market for the organisation and promotion of show-jumping competitions in light of its role as regulator for equestrian sports, as only FEI-accredited events are taken into account for ranking purposes (and, in fine, for participation in the Olympic Games). The College considered that the reduction, for GCT events, from 60 to 30 per cent of invitations based on the riders’ official ranking created a difference in treatment between GCT events and other FEI-accredited competitions that was not justified by the specificities of the sport sector. Therefore, it was not unreasonable to conclude that the defendants’ practices might be abusive. The College further found that the harm suffered by riders and teams was sufficiently serious and imminent, and its impact on their image and future activities was difficult to quantify and adequately compensate ex post. Consequently, the BCA suspended the MoU insofar as it reduced the share of invitations based on the official ranking below 60 per cent until the adoption of the decision on the merits. The case on the merits is ongoing. On 23 March 2017, the Commercial Court of Ghent awarded damages to parallel importers of Honda motorcycles, ending judicial proceedings against Honda that had lasted over 10 years.15 The BCA had previously investigated Honda’s conduct and, in 1999, fined the company for abusing its dominant position on the market for the issuance of Honda motorcycles conformity certificates in Belgium. This decision became final only in 2011 after multiple appeals. In 2006, several parallel importers of Honda motorcycles filed an action for damages against Honda. Honda argued that the plaintiffs’ claims were time-barred pursuant to Article 2262bis of the Belgian Civil Code, which provides for a five-year limitation period for tort-based damages claims, in light of the 1999 BCA decision. The Commercial Court referred a request for a preliminary ruling to the Constitutional Court regarding the starting point of the limitation period for damages claims arising from breaches of competition law. In 2016, the Constitutional Court ruled that limitation periods of antitrust damages claims cannot expire before a final decision of the competition authority (or the end of the investigation by other means).16 In its judgment, the Commercial Court of Ghent applied this principle, and held that the parallel importers’ damages claims were not time-barred because they were filed while the appeal against the BCA decision was still pending. The Court, however, held that the harm, which stemmed from events dating as far back as 25 years, was practically impossible to quantify, and as a consequence assessed it ex aequo et bono and granted each plaintiff €20,000 (plus interest from 1997). The Brussels Court of Appeal confirmed the BCA’s decision. It held that an acquisition creating a concentration not covered by merger control rules does not as such amount to an abuse of dominance, as other conduct must accompany the concentration. This other conduct must have restrictive effects on competition that are distinguishable from the effects of the concentration itself, and must qualify as a prima facie abuse of dominance (rather than being potentially abusive). The Brussels Court of Appeal further rejected AM’s objections that the BCA’s test was more stringent than the test typically used to assess an abuse of dominance under Articles 102 TFEU and IV.2 of the CEL. On 13 December 2017, the Brussels Court of Appeal dismissed an appeal by Distripaints NV (Distripaints) and Novelta NV (Novelta) regarding the use of documents seized by the BCA at their premises during dawn raids conducted in 2011 in the context of an investigation into an alleged abuse of dominance and collusion involving chemical producer AkzoNobel NV (Akzo).20 During the BCA’s dawn raids, Akzo distributors Distripaints and Novelta had contested the relevance of documents collected by the BCA, which had therefore been sealed for subsequent review. In 2013, the Auditorate lifted the seal and considered certain documents as within the scope of the investigation (‘in scope’), and the two companies appealed this decision before the Brussels Court of Appeal. The Court rejected some of their claims in an interim judgment in 2014, but accepted their claim regarding the insufficient statement of reasons provided by the BCA to justify the ‘in-scope’ character of the documents, and ordered the BCA to provide an expanded statement of reasons and the BCA and claimants to discuss whether the documents were ‘in-scope’ or not.21 The BCA provided an expanded statement of reasons, but could not agree with the claimants regarding the ‘in-scope’ character of the documents, so that the Court had to rule on this point. Inter alia, the claimants argued that their rights of defence were breached in light of contradictions in the original mission order, in which they were described both as victims of and participants in the various anticompetitive practices, including an abuse of dominance. In its December 2017 judgment, the Brussels Court of Appeal referred to principles established by the EU courts, and held that its review was marginal and aimed at protecting against arbitrary and disproportionate interventions and to preserve the rights of defence. On this basis, the Court considered that the BCA had appropriately supplemented its statement of reasons for considering documents as ‘in-scope’, with an individual reasoning for each document that was not prima facie unacceptable, unreasonable or illegal. Therefore, the BCA’s ‘in-scope’ documents could remain in the case file. When it comes to market definition and the assessment of dominance, the BCA and the Belgian courts can be generally expected to use the same criteria as the European Commission, the General Court and the European Court of Justice. As noted above, the definition of ‘dominance’ provided by Article I.6 of the CEL is directly derived from the well-known formula expressed by the European Court of Justice in Hoffmann-La Roche. Likewise, as under EU law, it is essential under Belgian law to first define the relevant markets before assessing whether an undertaking holds a dominant position. Unsurprisingly, the main criterion used to define the relevant product and geographic markets is that of ‘substitutability’, which is first of all assessed on the demand side. Products and services are considered part of the same market if they are regarded as substitutable for users or consumers, by reason of their characteristics, prices and intended use. The assessment of substitutability should also reflect any sources of potential competition (new products, potential entry of a new competitor on the geographical market, etc. ), and any relevant constraint that may affect the demand structure, such as the existence of a specific regulatory framework. In addition, the substitutability does not need to be perfect if it is effective for a part of the goods or services at issue that is significant enough to materially affect factors driving competition, in particular prices. In line with practices at the EU level, the assessment of dominance requires consideration of various factors that, taken separately, are not necessarily determinative.25 Among these factors, considerable importance is given to market shares. Although the CEL does not provide for a market-share threshold above which an undertaking would be deemed dominant, the BCA has considered in the past that a market share exceeding 50 per cent entailed a presumption of dominance.26 Likewise, a market share exceeding 40 per cent, while not decisive in itself, has been viewed as a very important indication of the existence of a dominant position.27 Conversely, the BCA has also proved that it is open to more sophisticated approaches whereby ‘a considerable market share is not automatically considered as equivalent to a dominant position’.28 Overall, Belgian practice recognises the need to assess the position of an allegedly dominant company in comparison with the position of its competitors and to consider in particular, as a proxy for the ability to circumvent competitive constraints and as evidence of a possibility to behave independently of competition:29 the differences in market shares;30 the evolution in time of market shares; the concentration index of the relevant markets; the existence of barriers to entry; the significance of potential competition; the existence of network effects; the vertically integrated structure of competing firms; competing firms’ respective economic and financial power; and the nature of the contentious practices. Finally, there are only a couple of precedents in which the BCA has had recourse to the concept of collective dominance. The main one to date is the 2014 decision dismissing a complaint brought against various film studios.32 The complaint against the studios involved digital screening fees paid by major record companies (the majors) to certain theatre owners and ‘incubators’, but not to the complainant. The Auditorate summarily referred to the Sony/BMG criteria. Finding that they were inapplicable to the case at hand, it thus rejected the allegation of collective dominance on the part of the majors. Moreover, it noted that the European Commission had already investigated the substance of the companies’ contracts involving digital screening fees and had closed its investigation after the contracts in question were amended. Generally, the abusive character of a commercial practice implemented by a dominant company depends on its actual or likely effects on competition. To assess the materiality or likelihood of such effects, the BCA and courts typically rely on specific tests designed for certain categories of practices, which are then applied to the facts of each case. These tests tend to create presumptions that are rebuttable in view of the circumstances prevailing on the relevant markets and the actual effects observed (or lack thereof). Similarly, a practice is only regarded as abusive after consideration has been given to possible objective justifications, if any, put forward by the dominant company. Unfortunately, Belgian courts sometimes tend to adopt a formalistic approach to the notion of abuse, occasionally driven by underlying ‘fairness’ considerations. The leading precedent on predation is Electrabel.36 The case involved allegations of predatory pricing on the part of the incumbent gas operator, Electrabel, at the time of the liberalisation of the sector. The allegations were dismissed for two main reasons: the short duration of the alleged predation (six months), which was considered too short to implement a credible predatory strategy; and the fact that no alternative operator had exited the market during that period. The offering of rebates characterised as exclusive tends to be treated somewhat strictly by the BCA and courts. Thus, on 27 September 2013, the Brussels Court of Appeal upheld the BCA’s decision of 30 July 2012 imposing a €245,530 fine on Presstalis,42 a French media distributor, for providing French publishers an extra 2.5 per cent discount (BSC) on top of other volume-based discounts in exchange for the exclusive right to export their magazines to the Belgian, Swiss and Canadian markets for a period of 12 months.43 The BCA found that the BSC discount had had a ‘strong fidelity effect’, and enabled Presstalis to foreclose competitors both on the market for the export of French magazines and, through its privileged relationship with Belgian distributor AMP, on the market for the distribution of those magazines in Belgium. While confirming that the proof of likely (and not actual) foreclosure effects on competitors that are at least as efficient as the dominant company was sufficient to establish an abuse, the Court adopted a strict view holding that loyalty discounts provided in exchange for exclusivity are as such in violation of Article 102 of the TFEU. The Court concluded that the BCA correctly qualified the BSC discount as a loyalty discount, and ruled that it was sufficient that the BSC discount placed competitors in a less favourable economic position than Presstalis. Leveraging allegations have occasionally been made in Belgium. In National Lottery, the National Lottery acknowledged forms of leveraging in a BCA settlement decision in 2015.46 Following complaints, the Auditorate had investigated the National Lottery’s conduct at the time of its launch of Scooore!, a new sports betting product. The Auditorate found that the National Lottery had abused its dominant position through a one-off use of customers’ contact details to promote Scooore!. The contact details had been collected through its legal monopoly, where competitors were unable to collect data of a similar scope and nature at reasonable costs and within a reasonable period of time. In addition, the National Lottery had obtained commercially sensitive information about competitors, both before and after the launch of Scooore!, from some of its retailers, for which the sale of lottery products represented a significant share of their turnover. While the principle according to which dominant players should remain free to choose their trading partners is well understood by the Belgian courts, exceptions to this principle are sometimes found on the basis of ad hoc tests that are applied quite flexibly. This is well illustrated by Ducati/DD Bikes, in which the Ghent Court of Appeal upheld a lower court judgment finding Ducati guilty of abusive refusal to supply spare parts and other repair equipment to a former dealer-repairer following the (otherwise lawful) termination of the dealership agreement.51 After finding that Ducati, through its official dealers, was dominant on a Ducati brand-specific market for maintenance and repair, it laid down its own test to appreciate the abusive character of the refusal to supply without any reference to EU or other precedent (very uncommon in Belgian case law) and dismissed, for example, free-riding arguments or the relevance of the fact that the repairer sold and serviced other brands of motorbikes. In addition to holding Ducati’s refusal to supply abusive, the Court imposed on it a number of obligations aimed at ensuring that DD Bikes could effectively offer after-sales services for Ducati motorbikes in the future. This case should be understood in the context of long-term dealership agreements in Belgium, and testifies to a historical tendency on the part of Belgian courts to protect the interests of dealership holders. Other cases involving Electrabel were dismissed. In Lampiris/Electrabel and NMBS/Electrabel, the BCA and the Brussels Court of Appeal both dismissed similar excessive pricing claims.63 Both found that Electrabel’s incorporation into its wholesale prices of the value of emission allowances obtained for free was economically justifiable, since the allowances could otherwise be traded. Beforehand, the leading precedent involved the allegedly excessive character of an increase in Electrabel’s natural gas prices.64 After comparing Electrabel’s prices with a number of competitive price benchmarks – for example, prices of alternative operators, regulated prices and prices applied in other EU Member States – the BCA was not able to reach a finding of infringement. Belgian remedial practice differs from that observed at the EU level in two notable respects. First, whereas the Commission relies heavily on commitment procedures to deal with dominance cases, the BCA has adopted very few commitment decisions to date.73 Even though not formally a commitment decision but a dismissal, the Immoweb case set a precedent in Belgium for de facto commitment decisions at the level of the Auditorate. In 2015, the Auditorate opened an investigation into Immoweb’s use of ‘most favoured nation’ (MFN) clauses in its contracts concluded with software developers for real estate agencies. After a preliminary analysis, the Auditorate concluded that Immoweb, the operator behind Belgium’s most frequented real estate website, was dominant on a national market for web portals dealing primarily in real estate, and that the MFN clauses prevented Immoweb’s competitors from negotiating more commercially favourable terms with software developers, which increased the barriers to entry. Immoweb committed unilaterally to terminate the clauses at issue and not to include such MFN clauses in contracts concluded in the next five years. On this basis, the Auditorate decided to close its investigation, essentially dismissing the case without coming to a final determination about any abuse of dominance under Article IV.2 of the CEL and Article 102 of the TFEU, and without issuing a formal commitment decision under Article IV.47 of the CEL.74 As illustrated by National Lottery75 and Algist Bruggeman,76 the BCA may also adopt settlement decisions in dominance cases. In addition, whereas this is extremely rare at the EU level, the BCA commonly adopts interim measures in the course of dominance proceedings. As previously noted, the BCA (and the Belgian courts) typically issues a cease-and-desist order when finding an abuse of dominance. In contrast, behavioural remedies are uncommon, notably because commitment procedures have only been rarely used to date. Over the years, however, the BCA has developed an important practice of imposing positive obligations on an interim basis pending the completion of investigations into alleged abuses of dominance. That practice is rooted in Article IV.64(1) of the CEL, whereby the College may ‘adopt interim measures intended to suspend the anticompetitive practices under investigation, if there is an urgent need to avoid a situation likely to cause serious, imminent harm that would be difficult to remedy [ex post]’. 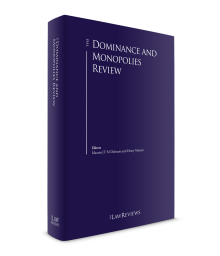 There has been no recent reported case of structural measures (such as split-ups or divestitures) imposed or ordered at the Belgian level to remedy an abuse of dominance. The structure of the BCA, and the procedure applicable to dominance cases, was entirely redesigned upon the entry into force of the CEL in 2013. Decisions of the BCA may be appealed before the Brussels Court of Appeal. The Court has shown willingness to rule against the BCA, in particular with respect to companies’ rights in the context of inspections (even the Court’s recent Distripaints/Novelta judgment, which confirmed the BCA’s determination of ‘in-scope’ documents only after the BCA provided an expanded statement of reasons). Recent developments show that the Court is ready to endorse the BCA’s practice as regards interim measures decisions. It should be noted that settlement decisions may not be appealed by the settling parties under Belgian law. Finally, the CEL contains an antitrust blocking statute, subject to exceptions to be set forth by Royal Decree.101 The principle of the primacy of EU law makes that provision unenforceable against requests from the Commission or from the competition authorities of other EU Member States addressed pursuant to Regulation 1/2003. Damage claims can also be filed to obtain compensation for harm suffered as a result of an (alleged) abuse of dominant position, either on a stand-alone basis or as a follow-on action. As the law currently stands, the CEL does not include a specific statutory basis for that purpose, so that general tort law principles apply and require plaintiffs to establish a fault imputable to the defendant, an injury suffered by the plaintiff, and a causal link between the fault and the injury.105 In 2017, the Belgian legislator implemented the EU Damages Directive, and thereby provided a specific regime for damage claims based on Articles IV.1 and IV.2 of the CEL or Articles 101 and 102 of the TFEU, or on both. Whereas the Damages Directive provides for a presumption that cartels cause harm, it does not include such presumption for abuses of dominance. Under Belgian tort law, damages are awarded according to the restitutio in integrum principle, whereby the victim must be compensated for the entire harm suffered (i.e., to restore the status quo ante) but only the actual harm suffered. Hence, Belgian law allows for the recovery of any direct losses and profits forgone (including losses of business opportunities), but does not recognise treble or punitive damages. In spite of the lack of clear precedent in the antitrust field, commentators have commonly admitted that the passing-on defence can be invoked by defendants, a position that should be formalised in the implementation of the Damages Directive. Upon request, damage awards can also include (simple, not compound) interest from the date the injury occurred, and be complemented by a fixed (and relatively modest) indemnity of procedure supposed to cover attorneys’ fees and other costs and disbursements. The Belgacom/Base & Mobistar case, discussed in the 2016 edition of this chapter, addressed the question of an undertaking’s fault in cases of abuse of dominance.106 The former incumbent telecommunications operator, Belgacom, and mobile competitors Mobistar and Base had been involved in a long-running damages litigation for alleged pricing abuses. The abuses revolved around the different mobile termination rates charged by Belgacom depending on whether calls were initiated and terminated on its network (on-net) or initiated from other networks and terminated on its network (off-net). While the parties settled the litigation in October 2016, the Brussels Court of Appeal held before that Belgacom should have known, in light of established EU precedents, that its alleged practices would constitute breaches of Article 102 TFEU and therefore faults on its part (if they were confirmed by experts). With respect to the network effects in particular, the Court noted that the fact that the EU courts had not yet expressly decided on such practices did not mean that these could not amount to anticompetitive conduct. In particular, the Court held that the language of Article 102(a) TFEU,107 existing EU case law and decisions, and Commission guidance, made it reasonably predictable that an unjustified difference between the costs of on-net and off-net calls would not be defensible in courts. The second case to date is Honda.111 In its 1999 decision (which became final in 2011, after multiple appeals), the BCA (then the Competition Council) found that Honda had abusively imposed overly burdensome conditions on parallel importers for obtaining conformity certifications; the parallel importers competed with Honda’s official authorised distributors. The Commercial Court of Ghent found a fault, a damage and a causal link as required under Article 1382 of the Belgian Civil Code. The Court held that the harm, which stemmed from events dating back as far as 25 years, was practically impossible to quantify. The Court agreed with Honda that the plaintiffs could not bring forward sufficient evidence of the harm, but considered that not granting damages would be contrary to the objectives pursued by the rules on the private enforcement of competition law, and therefore assessed the harm ex aequo et bono and granted each plaintiff €20,000 in damages, plus interest accrued since 1997. Finally, Belgian law permits plaintiffs to seek collective redress. Interestingly, the Collective Actions Act provides that only consumers and other organisations satisfying certain legal conditions, as well as the Federal Ombudsman for Consumers, are entitled to file a claim on behalf of a group for collective recovery, and that they may do so only before the Brussels courts.112 It is up to the court to decide whether to apply an opt-in or opt-out system. Likewise, the court must systematically require the parties to first explore the possibility of negotiating a settlement. It is only in the case of failure of such settlement that the court may hear and decide on the merits of the damages claim. The government is expected to table a draft law and the parliament is considering a proposal on a prohibition of abuses of ‘significant market power’ that would allow enforcement against non-dominant undertakings similar to the existing regulation in France. While the BCA has indicated its support for measures to fight against abuses of market power beyond Articles 102 of the TFEU and IV.2 of the CEL, the BCA President has stated that the enforcement of such new provisions would require additional staff if adopted. 1 Robbert Snelders is a partner and Thomas Woolfson and Athina Van Melkebeke are associates at Cleary Gottlieb Steen & Hamilton LLP. The authors wish to thank Damien MB Gerard, case handler at DG COMP, who drafted this chapter in recent years. The authors also wish to thank François-Guillaume de Lichtervelde and Thomas Verheyden, stagiaires with Cleary Gottlieb Steen & Hamilton LLP, for providing input and assistance for the 2018 edition of this chapter. 3 Case 85/76, Hoffmann-La Roche & Co AG v. Commission  ECR p. 461, paragraph 38. 4 Draft Bill on the Protection of Economic Competition, Comments on Articles, Doc. Parl., Ch.repr., ord. sess. 2005–2006, No. 2180/001, page 36 (see discussion on Article 2, which became old Article 1 of the 2006 APEC). 5 Communication from the Commission – Guidance on the Commission’s enforcement priorities in applying Article 82 of the EC Treaty to abusive exclusionary conduct by dominant undertakings  OJC 45/7 (Commission Guidance Paper). 6 Council Regulation (EC) No. 1/2003 of 16 December 2002 on the implementation of the rules on competition laid down in Articles 81 and 82 of the Treaty, OJEC, 4 January 2003, L 1/1-1/25. 7 As is the case at EU level, compliance with the applicable regulatory framework does not shelter dominant undertakings from the application of competition – including dominance – rules (see, for example, Competition Council, case 2012-P/K-32, Publimail, Link2Biz International and G3 Worldwide Belgium/bpost, 10 December 2012, paragraph 281). See also the presumption of discriminatory abuse of dominance provided for at Article 23 ter of the 1999 Electricity Act (Official Gazette, 11 May 1999, page 16,264). 8 Article IV.12 of the CEL. 9 That theory was upheld by the Belgian Supreme Court in 2000 (see Cass., 7 January 2000, Multipharma/Louis Widmer, RCJB, 2001, page 255). 10 Some restrictions still apply to consumer sales in relation to, for example, product bundling. 11 For a more recent restatement, see Court of Appeal of Brussels, 27 February 2014, Bureau d’Assurances Desert/AXA, (case 2013/AR/1783), paragraph 6, as published in TBM/RCB, page 353. 13 College, 19 June 2017, decision No. ABC-2017-V/M-24, Interim measures against Order of Pharmacists (case CONC-V/M-17/0017). 14 College, 20 December 2017, decision No. ABC-2017-V/M-38, Interim measures against FEI, GCL, and TTB (case CONC-V/M-17/0037). 15 Ghent Commercial Court, 23 March 2017, NV Honda Motor Europe Logistics/NV Herman Verboven et al (case A/12/02970). 16 Constitutional Court, 10 March 2016, Honda (case 38/2016). 17 Brussels Court of Appeal, 28 June 2017, Alken Maes NV/Belgian Competition Authority (case 2016/MR/2). 18 Council Regulation (EC) No 139/2004 of 20 January 2004 on the control of concentrations between undertakings, OJ, 29 January 2004, L 24/1. 19 College, 21 November 2016, decision No. ABC-2016-V/M-36, Alken Maes NV/Anheuser-Busch InBev NV (case CONC-V/M-16/0029). 20 Brussels Court of Appeal, 13 December 2017, Distripaints & Novelta/Belgian Competition Authority (case 2013/MR/9). 21 Brussels Court of Appeal, 26 November 2014, Distripaints & Novelta/Belgian Competition Authority (case 2013/MR/9). 22 See, for example, decision No. 2010-P/K-42-AUD, Freedom CVBA/InBev Belgium NV, paragraph 75. 23 For example, in Base/Belgacom Mobile, the Council found that, with regard to the geographical scope, all parties seemed to agree that the relevant market was the Belgian territory, and the Council subsequently adopted such a decision (decision No. 2009-P/K-10, Base/BMB, paragraph 130). 24 Commission Notice on the definition of relevant market for the purposes of Community competition law  OJC 372/5. 25 Decision No. 2008-P/K-10-AUD, FEGE/Idelux, page 6; decision No. 2009-P/K-10, Base/BMB, paragraph 139. 26 For a recent case, see decision ABC-2015-P/K-09-AUD of the Auditorate of 26 March 2015 in case CONC-P/K-09/0002, Lampiris/Electrabel, paragraphs 101–118. 27 In Unie der Belgische Ambulancediensten/Belgische Rode Kruis (decision No. 2001-V/M-22), the BCA considered that a market share of above 40 per cent gives a ‘strong indication’ of dominance, whereas a market share below 30 per cent, in the absence of additional factors, is ‘not indicative’ of dominance. For a discussion relying on the Commission Dominance Paper, see also decision No. BMA-2014-P/K-23-AUD of the Auditorate of 2 December 2014 in case MEDE-P/K-11/0027, NV Handling CO/Sony Pictures, The Walt Disney Company (Benelux), Universal Pictures International Belgium, Twentieth Century Fox Film Belge and Warner Bros Studios Leavesden Limited. For a discussion by a Belgian court, see, e.g., Court of Appeal of Brussels, Bureau d’Assurances Desert/AXA Belgium, 27 February 2014 (case 2013/AR/1783), TBM/RCB, 2014/4, page 352. 28 Decision No. 2009-P/K-10, Base/BMB, paragraphs 150 and 154. 29 Decision No. 2009-P/K-10, Base/BMB, paragraph 155 et seq. ; decision No. 2009-P/K-26-AUD, vzw Federatie HoReCa Wallonie/Vlaanderen et al/InBev NV, paragraphs 62–64; decision No.2008-I/O-41-AUD, Electrabel NV, paragraphs 77–78 and decision No. 2007-V/M-25-AUD, Merck Generics Belgium BVBA, Generics UK/Merck Sharp & Dohme BV and MSD Overseas Manufacturing Company, paragraph 21. 30 For example, the BCA has considered that a difference of 40 per cent between the market share of a dominant undertaking and its largest competitor constitutes in itself an indication of dominance (see decision No. 2007-V/M-25-AUD, Merck Generics Belgium BVBA, Generics UK/Merck Sharp & Dohme BV and MSD Overseas Manufacturing Company, paragraph 21). 31 In its decision of 26 March 2015 in case CONC-P/K-09/0002, Lampiris/Electrabel, paragraph 106, the Auditorate relied on a decision of the College of 18 July 2014, which had found Electrabel to be dominant on the wholesale electricity market, in case CONC-I/O-09-0015, Electrabel/Wholesale Electricity Market (decision No. ABC-2014-I/O-15). 32 Auditorate, 2 December 2014, decision No. BMA-2014-P/K-23-AUD, NV Handling CO/Sony Pictures, The Walt Disney Company (Benelux), Universal Pictures International Belgium, Twentieth Century Fox Film Belge and Warner Bros Studios Leavesden Limited (case MEDE-P/K-11/0027). In a recent case, the BCA closed an investigation into potential collective dominance by cargo handling companies at Brussels airport: see Auditorate 17 February 2015, decision No. BMA-2015-I/O-02-AUD, Cargo handling at Brussels National Airport (case MEDE-I/O-10/0009). For a case mixing concerted practices and collective dominance considerations, see judgment of the Court of Appeal of Liège of 5 February 2009 in case AGIM/Oxycure, TBM/RCB, 2009, page 60. 33 Court of Appeal of Ghent, 1 October 2014, Ducati/DDBikes (case 2010/AR/3351). 34 See, for example, Court of Appeal of Brussels, 3 November 2005, SABAM v. Productions & Marketing, TBM/RCB, 2006, No. 4, p. 320. 35 See, for example, decision No. 2009-P/K-10, Base/BMB, paragraphs 190 and 275 et seq. 36 Decision No. 2008-I/0-41-AUD, Electrabel NV. 37 Commission Guidance Paper, paragraph 69. 38 See, for example, Commercial Court of Brussels, 20 November 2006, Docpharma/Eli Lilly Benelux, TBM/RCB, 20007, No. 1, page 90. 39 Auditorate, 26 March 2015, decision No. ABC-2015-P/K-09-AUD, Lampiris/Electrabel (case CONC-P/K-09/0002). 40 Decision No. 2009-P/K-10, Base/BMB, paragraph 260. 41 Ibid., Base/BMB, paragraph 313, which refers to case COMP/38.734, Telefonica, paragraph 543, case T-271/03, Deutsche Telekom/Commission, Section 236 and case T-203/01, Michelin, paragraphs 239 and 241. 42 Competition Council, 30 July 2012, decision No. 2012-P/K-20, Tondeur Diffusion/AMP & Presstalis. 43 Court of Appeal of Brussels, 27 September 2013, Presstalis SAS. 45 Brussels Court of Appeal, 3 November 2005, SABAM v. Productions & Marketing, TBM/RCB, 2006, No. 4, p. 320. 46 Auditorate, 22 September 2015, decision No. BMA-2015-P/K-27-AUD and decision No. BMA-2015-P/K-28-AUD, Stanleybet Belgium NV/Stanley International Betting Ltd and Sagevas SA/World Football Association SPRL/Samenwerkende Nevenmaatschappij Belgische PMU SCRL (cases MEDE-P/K-13/0012 and CONC-P/K-13/0013). 47 College, 19 June 2017, decision No. ABC-2017-V/M-24, Interim measures against Order of Pharmacists (case CONC-V/M-17/0017). 48 In the Cargo handling case, the Auditorate closed an investigation (for lack of evidence) into practices that would have entailed a review of potential bundling practices by Aviapartner and Flightcare on the reserved market for airside freight handling and the downstream non-reserved market for landside freight handling services, see decision No. BMA-2015-I/O-02-AUD of 17 February 2015, Cargo handling at Brussels National Airport (case MEDE-I/O-10/0009). 49 Decision No. 2009-V/M-04, Bofar NV, paragraph 103. 50 Joined cases C-468 to 478/06, GlaxoSmithKline AEVE  I-7139. 51 Ghent Court of Appeal, 1 October 2014, Ducati/DDBikes (case 2010/AR/3351). 52 Auditorate, 22 March 2017, decision No. BMA-2017-I/O-07-AUD, Algist Bruggemans NV (case MEDE-I/O-13/0001). 53 College, 19 June 2017, decision No. ABC-2017-V/M-24, Interim measures against Order of Pharmacists (case CONC-V/M-17/0017). 54 Auditorate, 26 March 2015, decision No. ABC-2015-P/K-09-AUD, Lampiris/Electrabel (case CONC-P/K-09/0002), paragraph 142. 55 Decision No. 210-P/K-42-AUD, Freedom CVBA/InBev Belgium NV, paragraph 80. 56 Decision No. 2012-P/K-32, Publimail, Link2Biz International and G3 Worldwide Belgium/bpost. 57 Brussels Court of Appeal, 10 November 2016, bpost/Spring, LINK2BIZ International, Publimail, in the presence of the BCA (case 2013/MR/2). Bpost had applied a per-sender rebate model, whereby quantity rebates are based on the volume of mail supplied by senders. This model did not consider consolidators, which provide collection and sorting services to senders before forwarding the mail to bpost for distribution, as single senders. In 2011, the Belgian Institute for Postal services and Telecommunications (BIPT), the sectoral regulator, found the rebate scheme to be discriminatory and fined bpost. In a separate decision in 2012, the BCA found the rebate scheme to be abusive because of its loyalty-inducing effect and fined bpost (but deducted the BIPT fine from the initial fine amount). On 10 March 2016, the BIPT decision was annulled by the Brussels Court of Appeal. Then, on 10 November 2016, the Brussels Court of Appeal annulled the Competition Council’s decision for breach of the ne bis in idem principle. The Court considered that the facts underlying the Competition Council’s decision had already been subject to scrutiny by the BIPT and the sanctions that both authorities could impose were of a criminal nature under the European Convention of Human Rights, so that the conditions for ne bis in idem were met even though the two authorities operate under different legal regimes. 58 Case C-209/10, Post Danmark  ECLI:EU:C:2012:172. 59 Court of Appeal of Brussels, 3 November 2005, SABAM v. Productions & Marketing, TBM/RCB, 2006, page 319. 60 The management of reserve capacities on the Belpex electricity exchange, for the electricity wholesale market. 61 College, 18 July 2014, decision No. ABC-2014-I/O-15, Electrabel/Wholesale Electricity Market (case CONC-I/O-09-0015). As part of its reasoning, the College also repeated that, as a matter of principle, competition law is applicable to practices otherwise regulated by sector-specific rules. 62 College, 18 July 2014, decision No. ABC-2014-I/O-15, Electrabel/Wholesale Electricity Market (case CONC-I/O-09-0015), paragraph 147. 63 Court of Appeal of Brussels, 14 January 2015, NMBS/Electrabel (case 2010/AR/3112), TBM/RCB, 2016/1, page 33 and Auditorate, 26 March 2015, decision No. ABC-2015-P/K-09-AUD, Lampiris/Electrabel (case CONC-P/K-09/0002). 64 Decision No. 2008-I/O-41-AUD, Electrabel NV. 65 Court of Appeal of Brussels, 29 May 2012, Standaard Boekhandel, Prodipresse, VFP and Buurtsuper v. AMP. 66 N Petit, ‘L’application du droit de la concurrence par les juridictions belges – Une analyse tendancielle de la jurisprudence récente’, in JF Bellis (ed. ), Concurrence en droit belge et européen, Brussels, Larcier, pages 33–34. 67 Articles V.3–V.4 of the CEL. 68 Article V.6 of the CEL. 69 In a decision closing an investigation into alleged unfair prices (in light of available resources and priorities), the Auditorate mentioned that the Price Observatory may be better placed to investigate the price evolution identified by the complainant; see decision No. BMA-2015-P/K-10-AUD of 31 March 2015, [x]/Omega Pharma (case MEDE-P/K-02/0073), paragraph 53. 70 Articles V.3–V.4 of the CEL. 71 See the €1.06 billion fine imposed in case COMP/C-3/37.990, Intel (13 May 2009). 72 Decision No. 2009-P/K-10, BASE/Belgacom & Belgacom Mobile. 73 The BCA has adopted commitment decisions in only two instances so far: see decision No. 2005-I/O-52, NV Distri-One/BVBA Coca-Cola Enterprises Belgium and decision No. 2006-I/O-12, Banksys SA/FNUCM /Banksys SA; UNIZO/Banksys). Both decisions ended seven-year investigations into alleged abusive conducts. 75 Auditorate, 22 September 2015, decision No. BMA-2015-P/K-27-AUD and decision No. BMA-2015-P/K-28-AUD, Stanleybet Belgium NV/Stanley International Betting Ltd and Sagevas SA/World Football Association SPRL/Samenwerkende Nevenmaatschappij Belgische PMU SCRL (cases MEDE-P/K-13/0012 and CONC-P/K-13/0013). 76 Auditorate, 22 March 2017, decision No. BMA-2017-I/O-07-AUD, Algist Bruggemans NV (case MEDE-I/O-13/0001). 78 Guidelines on the method of setting fines imposed pursuant to Article 23(2)(a) of Council Regulation (EC) No. 1/2003, OJ, 2006/C 210/02). 79 Article IV.70(2) of the CEL. 80 Article IV.64(1) of the CEL. 81 Article IV.64(3) of the CEL. 82 Article IV.64(6) of the CEL. 83 College, 27 July 2015, decision No. ABC-2015-V/M-23, Interim measures against FEI (case CONC-V/M-15/0016), paragraphs 97–115. The FEI’s appeal to suspend the interim measures was dismissed by the Court of Appeal of Brussels in a first judgment of 22 October 2015, FEI/BCA (case 2015/MR/1, Official Gazette, 17 November 2015, pages 69 and 141), and confirmed by the judgment on the merits of 28 April 2016, FEI/BCA (case 2015/MR/1), TBH/RDC, 2016/8, page 761. 84 College, 24 November 2015, decision No. ABC-2015-V/M-68, Interim measures against FEI (case CONC-V/M-15/0016), pages 29–31, upheld by the Brussels Court of Appeal, 28 April 2016 [case 2015/MHR/1). 85 College, 20 December 2017, decision No. ABC-2017-V/M-38, Interim measures against FEI, GCL, and TTB (case CONC-V/M-17/0037). 86 College, 5 November 2015, decision No. BMA-2015-V/M-65, Interim measures against Telenet (case MEDE-V/M-15/0024), paragraphs 72–81, upheld by the Brussels Court of Appeal, 7 September 2016, Telenet/BMA (cases 2015/MR/2 and 2016/MR/1). 87 Article IV.42(4) of the CEL. 88 Article IV.42(5) of the CEL. 89 Article IV.45(5) of the CEL. 90 These time limits can be extended if the President of the BCA ‘deems it necessary’. The CEL also provides for various deadlines applicable to the Auditorate and the College, but these are considered indicative. For example, the College is supposed to hold an oral hearing at the latest two months after the filing by the parties of their written comments on the draft decision, and to issue its decision within one month of the oral hearing (see Article IV.42(5) and Articles IV.45(3),(4) and (6) of the CEL). 91 Article IV.45(1) of the CEL. 92 Article IV.45(2) of the CEL. 93 Article IV.45(5) of the CEL. 94 Article IV.49 of the CEL. 95 Articles IV.51–IV.57 of the CEL. 96 Decision No. BMA-2015-P/K-27-AUD of 22 September 2015; the Auditorate adopted a second decision on the same day, dismissing the complainants’ other allegations, see decision No. BMA-2015-P/K-28-AUD, Stanleybet Belgium NV/Stanley International Betting Ltd and Sagevas SA/World Football Association SPRL/Samenwerkende Nevenmaatschappij Belgische PMU (cases MEDE-P/K-13/0012 and CONC-P/K-13/0013). 97 Article IV.20(2) of the CEL. 98 The applicable procedure has been spelled out in a BCA communication of 27 January 2015. 99 Court of Appeal of Brussels, 5 March 2013, Belgacom (case 2011/MR/3) as upheld by the Belgian Supreme Court in Cass. (Belgian Supreme Court), 22 January 2015, Auditorate/Belgacom-HG (case C.13.0532.F). 2014 (joined cases 5733 and 5740). 101 Article IV.13 of the CEL. 102 Further, infringements of Chapter IV of the CEL are considered to fall within the scope of the notion of ‘unfair trade practices’ pursuant to Article VI.104 of the CEL. 103 Article XVII.10 et seq. of the CEL. That procedure is dealt with according to the rules applicable to interim proceedings but is not subject to the requirement of urgency. 104 Court of Appeal of Ghent, 7 March 2016, BIT Marketing/SEB (case 2015/AR/1594), TBM/RCB, 2016/4, page 403, and Court of Appeal of Antwerp, 27 October 2016, Bierhalle Demeyer NV/Duvel Moortgat (case 2015/AR/2657), TBM/RCB, 2016/4, page 442. 105 These principles are rooted in Article 1382 of the Belgian Civil Code. In theory, contractual liability can also be invoked to obtain damages or even the nullity of a contract, depending on the terms of the contract in question and the circumstances of the case. 106 Court of Appeal of Brussels, 26 February 2015, Belgacom/Base & Mobistar (case 2012/AR/1). 107 Prohibiting ‘directly or indirectly imposing unfair purchase or selling prices or other unfair trading conditions’. 108 Constitutional Court, 10 March 2016, Honda (case 38/2016), and Ghent Commercial Court, 23 March 2017, NV Honda Motor Europe Logistics/NV Herman Verboven et al (case A/12/02970). 109 See, for example, Court of Appeal of Brussels, 25 January 2005, Ann prat 2005, page 743 and Commercial Court of Brussels, 15 November 2006, RG 8069/02. 110 Brussels Commercial Court, 17 June 2010, UGC Belgium v. Kinepolis Group, SA Compagnie de Promotion Liégeoise, SA Compagnie de promotion Charlemagne and SA Wilhelm & Co.
111 Constitutional Court, 10 March 2016, Honda (case 38/2016), and Ghent Commercial Court, 23 March 2017, NV Honda Motor Europe Logistics/NV Herman Verboven et al (case A/12/02970). 112 Articles XVII.35–XVII.69 of the CEL. 113 BCA, Priority Policy for 2018, 6 April 2018.